Catherine, Duchess of Cambridge attended the opening of the V&A Photography Centre at Victoria & Albert Museum on Wednesday (October 10) in London, after she became the Royal Patron of the V&A in March 2018. 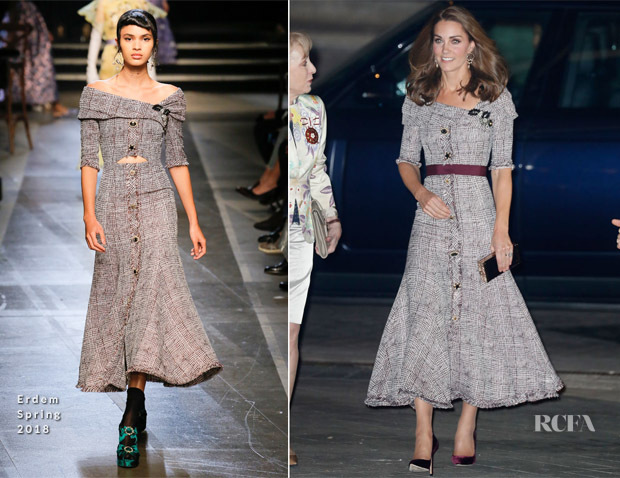 For her first visit in the role, the Duchess wore an Erdem Spring 2018 dress. I have to say, this is easily her best look in the last 3 or 4 years. The look is very elegant, and dare I say modern. I can finally say I that I love the styling, which included Bordeaux velvet Jimmy Choo ‘Romy’ pumps, clutch and sash. You may remember that Carey Mullgian wore this same dress back in November last year, with accessories that didn’t make nearly the same impact.